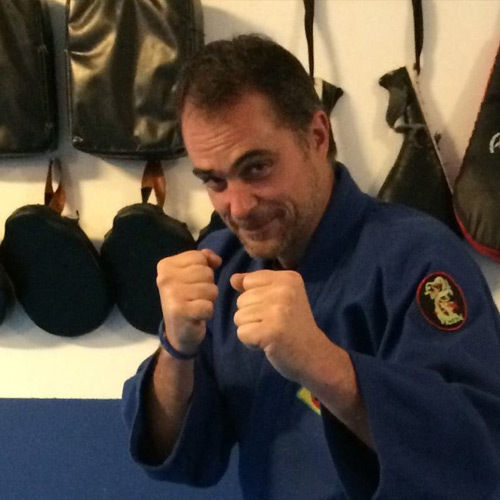 Vincent Ingenio has been training in the martial arts for over 35 years. He obtained his first black belt in Tae Kwon Do when he was sixteen. He went on to study numerous arts over the years to include Aikido, Jeet Kune Do, Wing Chun, and kyokushin Kai karate. He studied Tai Chi, Chi Gung and acupuncture at the New Center for Holistic Health in Long Island as well as Chi Gung under Kwan Sai Hung and Tai Chi push hands with Robert Hoffman. He obtained his second black belt in Tang soo do in 2002. He was trained in police defensive tactics with the DCSO as well as trained intimately with NYS parole defensive tactics and firearm instructors. He was also trained in military tactics and combatives as a member of the U.S Military. He has years of training in wilderness survival and awareness skills as well as guerrilla tactics primarily through the Tracker school under Tom Brown Jr. In 1996 Vincent started training in Bujinkan Budo, one of the the last schools for authentic ninjutsu training. The Bujinkan is the combination of 9 different schools of Japanese martial arts some of which are almost a thousand years old. 6 of these schools are Samurai sourced schools teaching Japanese battlefield jujitsu and Budo “warrior ways” to include classical battlefield weapons and tactics. The other three schools are ninjutsu schools which include more guerrilla style tactics and fighting as well as covert methodology and awareness skills. Vincent traveled to Japan twice to train in Bujinkan Budo under the masters and was given the “sword test” under the hands of the Grand master Masaaki Hatsumi and passed successfully awarding him the right to teach the art and award promotions up to 4th Dan. Vincent presently holds the rank of 8th degree black belt in the Bujinkan. He has taught 100’s of children, teens and adults in NY, NJ, and PA in martial arts, wilderness survival skills, awareness and women’s self defense. He has received numerous awards and acknowledgements over the years for his teaching and his martial art accomplishments. In 2016 in a never stop learning and improving attitude Vincent decided he wanted to improve his unarmed ground grappling skills and knowledge so he tied on the white belt once again and started training in Brazilian Jujitsu under Aaron Harris and Mike Wacker at Black Hole Jujitsu and has not looked back.